Ancestry.com is the largest genealogy website in the world and has been in business since 1983 and online since 1996. They have over 20,000 public record databases from numerous countries that members can search for their family history. Combining all of these databases together would give you over 20 billion records, with millions of new records being added each week. 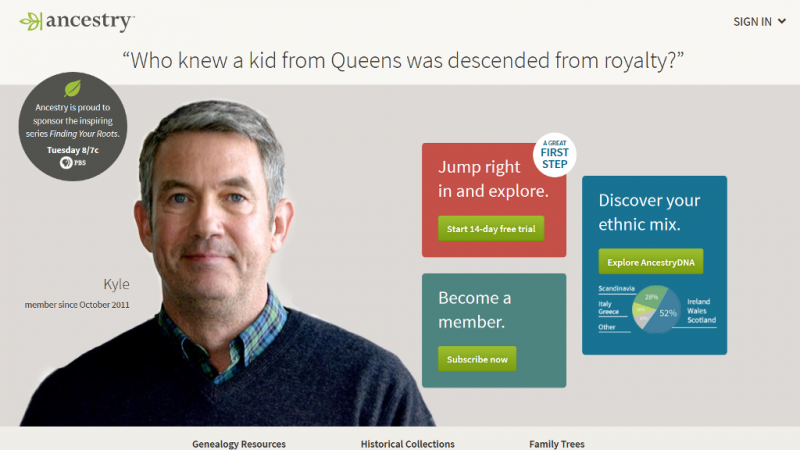 Ancestry is constantly adding new content for users who are interested in discovering their family history. They have a digitizing system that can handle historical hand written documents and they have many relationships with all levels of government archives, religious institutions and historical societies to gain access to these documents. 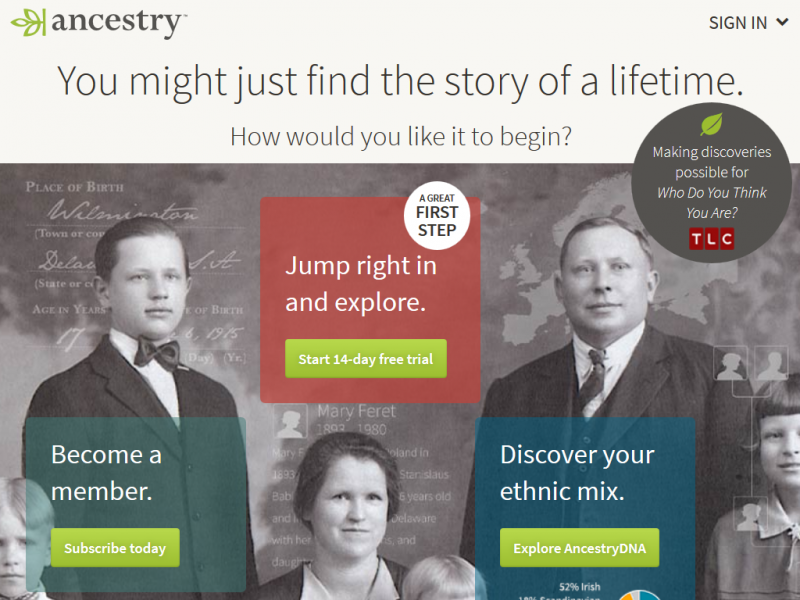 Plus, Ancestry.com has the largest online community of people interested in family histories. This community generates much content, from creating public family trees, to uploading documents and photos. In the last 4 years alone more that 24 million family trees have been create that contain 2.4 billion profiles. Over 60 million uploaded documents and pictures have been attached to these trees along with 940 million records from Ancestry.com databases. All this information available to members may seem daunting but Ancestry.com provides easy to use tools that makes finding other family members simple. Once you have entered all the information you know about your family there is also a simple search option that Ancestry.com provides which fills in any missing information that Ancestry.com has stored in their databases about your family. Ancestry.com has lots of data, in fact they have over 20 billion records of information. There records are grouped into Collections, then by Category and then, organized into Card Catalogs. Collections can usually be filter by location, language and date and are broken up into broad categories. Popular Collections include "Census & Voter Lists", "Birth, Marriage & Death", "Family Trees", "Immigration & Travel" and "Military". Categories within collections depend on what the actually Collection is about. For example the "Birth, Marriage & Death" Collection has the following Categories "Birth, Baptism & Christening", "Marriage & Divorce", and "Death, Burial, Cemetery & Obituaries". Within each Category you will find the Card Catalog. The Card Catalog contains the actual records. The name of the Card Catalog usually contains the source of the material, location and the date range of the records included with it. Most of the records on Ancestry.com range in date from the 1790s to the 1940s. The reason for this is most governments like the United States and Canada hold the records of their citizens (like the ones collected in the Census) confidential for a number of years before they are made public. The U.S. Census is kept private for 72 years making the 1940 Census the most current one available to the public. The U.S. 1950 Census will be available to the public in April 2022. In Canada they hold their Census data confidential for 90 years making the 1921 Canadian Census the most recent one available for viewing. For this reason when you start a family tree on Ancestry.com it will make things easier if you know the name of a family member who was born before the last publicly available census (this is true for all genealogy services). Since your family history is all about information, it is important that the ability to perform searches is easy to understand and returns the desired results. There are a number of ways to search for your family history on Ancestry.com. One of the easiest ways is to start to fill out your family tree with your parent and grandparent information. Every person you add Ancestry will perform automated searches on their Collections to provide you with additional information about that family member and suggest new members that look like they may belong to your family. You are also able to search the Collections and Card Catelogs directly as well via a basic search form, an advanced form and by location through maps of countries. Depending on the Collection you are searching and the information you are looking for, will determine the type of criteria that is available on the search forms. For example military information is not going to be available from the "Birth, Marriage & Death" Collection. The Ancestry.com online community is 3 distinct parts. The first part called "Member Connect" allows you to stay in touch with other Ancestry members who also happen to be researching family members who may be related to you. To find these members Ancestry.com will scan the publicly available family trees (some members keep their family trees private) to find people who are also researching ancestors who may be related to you. Once the scan is complete you can decide whether or not you wish to connect. Once connected you will receive updates on any new information the person may add about your ancestor. At this point you also have the option to add to your tree this new information. Member Connect also allow you to communicate with the member to exchange stories and facts or even to plan research projects. The online community also contains very active message boards. These boards are categorized by location as well as topics. There are over 17 million posts across 161,000 message boards at Ancestry. The World Archives Project is also a big part of the online community. Ancestry.com setup this project so members get a chance to help save the world's historic records which are fast being destroyed. How it works is participants access digital record images from Ancestry.com. The participant then reads over the image of the record and adds any names, dates and other relevant information to the database so the record can then become searchable online. Any record that is part of the World Archives Project will remain free to the public and Ancestry.com will make sure to donate copies to partner archives (government, societies, etc.). In the future Ancestry.com also plans to allow contributors free access to the original images, and for those who subscribe, they are eligible for 10 to 15 percent of renewals of memberships at Ancestry.com. Over 5 million people have ordered AncestryDNA kits (an extra cost of $99 USD) and sent in DNA samples to have their DNA analyzed. Ancestry labs will look at more than 700,000 genetic markers to determine your ethnic mix from 26 different ethnic regions (including those from America, Europe, Africa, West Asia, Asia, and Pacific Islander). Within 6 to 8 weeks after you have mailed in your sample you can expect an email with a link to your online results. Your results will also allow you to connect with relatives you may never known you had, since Ancestry will scan their database and identify the people who share your DNA. * Prices usually based on monthly subscription. Prices may increase/decrease depending on subscription length. All prices in USD unless specified other wise. Costs and features offered last checked April 06, 2017. With all the content Ancestry.com provides and with their ability to convert hand written documents to digital makes this genealogy website your number one choice for people who wish to find out the history of their family. The search features and other online tools available at Ancestry.com, plus the active online community were also a large factor in us giving Ancestry.com my highest rating. You receive a 14 day free trial and from their you have complete access to over 13 billion records. Plus you can view detailed scans of original documents and photos (over 50 million photos). Most Genealogy services have just census records. With Ancestry you also have access to a large collection of military and immigration records. Some of our visitors have pointed out that the cost is more expensive than most and while this is true, the data and features Ancestry provides over top of all other competitors makes this genealogy website the winner in my book. Largest number of public records that you can search from multiple countries. Higher cost than similar services. I started the free trial to look up my step daughters family. Not only did I find a lot of information for her I found out a lot about my own family I didn't even know about. There was people who I thought came from one country of origin but was actually another. I went back 5 generations with my own family now and the tree I have created is very extensive with lots of pictures and other information. I am happy with the service I received. I rather pay less, but for the moment what I pay every month is fine as I still use it. Many records on my family. Found a lot of information about my grandparents I never knew. I checked out Ancestry.com when I signed up for a 2 week free trial. I ended up cancelling after a week and a half. I received an email confirmation from Ancestry showing I had cancelled. Well today I find out that I have been billed. I called customer service and after he checked my account he saw the mistake and refunded me the money right away and offered his apologies. It was a relief but I still shouldn't have to double check that a cancelation went through. I tried MyHeritage.com first and then Archives.com a month later. I didn't like Archives and MyHeritage was okay but I found I really liked how Ancestry.com was setup. It's very easy to get in and start setting up your family tree. Maybe part of it is because I tried the other genealogy services first so I was more use to how things worked when researching your faimily history. I just found that when I searched the records on Ancestry it just seemed easier to find things. They do have more records but the way the search works makes it easier to find the records you are looking for. So I plan on sticking with Ancestry and hopefully in the next few months putting in several hours a week I should have figured out quite a few generations back of my family tree. Searching the records is the easiest of the 3 sites I tried. I could not have done my research without Ancestry. I was always interested in my heritage so last year I decided to join Ancestry.com to do research and gather the facts so I could make a book on our family that I can give as gifts for Christmas next year. I didn't realize what I was in for and the amount of information which is available. I was able to track my ancestors back over 200 years to Europe and England. I got a lot of interesting photos and stories as well not only from the records they have online (including the military ones) but from 2 other users of Ancestry who share some of the same relatives. It's really neat how you can share your family trees and instantly expand your own. I have almost all of the research done now that I want (you could keep finding out stuff forever if you want) and plan to start organizing it in a format so it will be enjoyable to be read by the family. Great for researching your family history. Monthly subscription does add up. While I was putting in the information for my family tree on Ancestry I notice that it pulled information from other users family trees. The problem is a lot of the information from the one family tree from a certain user was incorrect. I am not sure if the information was not verified or what. The info was from my immediate family so I know what was correct so I contacted the person requesting they make the changes. I did not hear back from the person at all and Ancestry apparently can not do anything about it to correct the tree. So the information will remain and the pictures will be for the wrong person. I continue to use the Ancestry site as it does offer a lot. Just be careful of some users information for their family trees as it may be incorrect and if they are not currently using Ancestry there is nothing you can do to correct it. The government documents Ancestry offers is where they shine and make it well worth the subscription. Some of the user trees are incorrect and will cause issues with your own if related.